The Malwa King- Paramara Raja Bhoj, was struck with sickness and after consulting many Vaidyas (Doctors) approached a saint. The saint suggested him to build a tank that was fed by 365 tributaries and rivers. The current place was fed by 359 and with the help Gond Commander Kalia (who gave the King information about an underground river), this tank was formed. 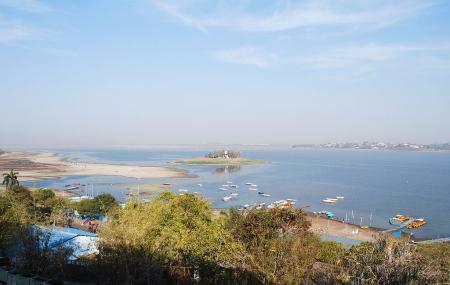 Today, the Upper lake is a vast expanse of water that reflects the city scape of Bhopal and is a major cultural and religious place for immersing idols of God and Goddesses during festivals. The island in the middle of the lake has the tomb of Shah Ali Shah RahamatullahAlla.Tourist boat trips are arranged at the place by local organizers. Don’t miss out on the sunsetshere. Admission to the lake is free. For prices of boat trips, contact local organizers. For timings of boat trips, contact local organizers. How popular is Upper Lake? People normally club together Rani Mahal and Tropic Of Cancer while planning their visit to Upper Lake. Everything of this place are very attractive..
Bhojtal, formerly known as Upper Lake, is a large lake which lies on the western side of the capital city of Madhya Pradesh, Bhopal. It is a major source of drinking water for the residents of the city, serving around 40% of the residents with nearly 30 million imperial gallons (140,000 m3) of water per day. Bada talaab, along with the nearby Chhota Talaab, meaning small lake in Hindi, constitute Bhoj Wetland, which is now a Ramsar site. According to the local folklore, Bhojtal is said to have been built by the Paramara Raja Bhoj during his tenure as a king of Malwa (1005–1055). He is also said to have established the city of Bhopal (also named after him, then as Bhojpal) to secure the eastern frontier of his kingdom. There is a legend why they built the lake. Once king Bhoj suffered from skin disease and all Vaidyas (Doctor in English) failed to cure him. Then, one day a saint told the king to build a tank to combine 365 tributaries and then have a bath in it to wipe out the skin disease. Bhoj called upon his engineers to build up a huge tank. They spotted a place near river Betwa, which was 32 km away from Bhopal. It was found that it has only 359 tributaries. A Gond Commander Kalia fulfilled this shortage. He then gave the address of an invisible river. After merging the tributaries of this river the number 365 was completed. Upper Lake(Bhojtal) is Very Large, Beautiful, Clean and Fabulous Lake!!! !